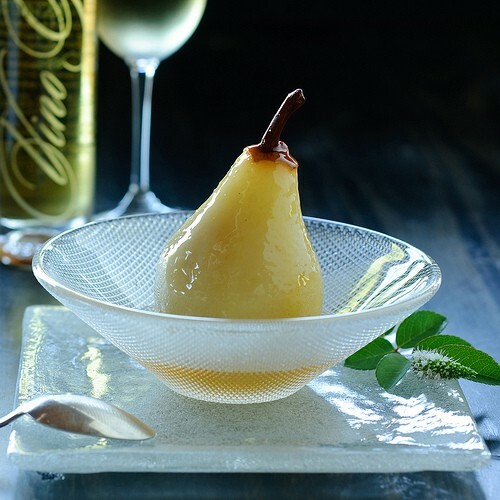 Photograph Michael Shay from Polara Studios photographed this delighted poached pear and was kind enough to shared his recipe with us! Enjoy! There are so many delights of fall you can almost forget harvest and Indian Summer portend the continual grey drizzle of Willamette Valley winter. Pears join the seasonal parade of prime fruits and nuts. The finest pears come from the high elevation orchards of Hood River that tower above the Columbia River and spread along the north slopes of Mt. Hood. The farmers host both Blossom and Harvest Festivals to show the orchards at their finest with stunning vistas of Mt. Adams and Mt. Hood as the backdrop. There are vineyards near the river and windsurfers in the river. Eighteen varieties of pears are produced, and if you visit during harvest (there are even historical train tours), you can taste them all. For poached pears, however, we don’t get too exotic. Kelly Shattuck, pastry chef at The Dundee Bistro, agrees with sticking to the familiar Bosc for their elegant shape and fine texture. Pears evoke harvest, and this recipe has become a perennial Ponzi harvest season dessert. 1. To prepare the pears, cut a little slice off the bottom so each will sit straight. Leave the stems on. Peel and core from the bottom using a small melon baller. 2. Combine the cheese with the nuts and fill the centers of the pears with the mixture. 3. Bring the Vino Gelato and water to a boil in a heavy, flat-bottomed saucepan. When boiling, add the lemon juice. Reduce the heat. Split the vanilla bean and scrape the seeds into the liquid. Add the pears upright in pan, and simmer just until tender, approximately 8�"10 minutes. 4. Carefully remove the pears with a slotted spoon. Set aside to cool or put directly into individual serving dishes (here’s a chance to use those old flat champagne glasses). Refrigerate until ready to serve. 5. Reduce the liquid in the saucepan to make a sauce. Taste and add sugar if more sweetness if desired. Strain. Garnish the pears with sauce just before serving. A cinnamon stick can be added with the vanilla�"or omit the vanilla�"depending on your taste. You can omit the cheese filling and serve with ice cream also topped with the pear sauce. This is an excellent choice as a dessert for a large dinner party; it’s light, pretty, and can be made ahead of time…and is perfect with Vino Gelato.